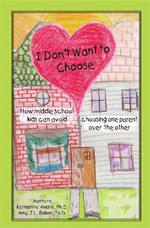 31 August 2012 – Dear Judge: life’s perfect with this parent .. The Scottish Government legislative changes referred to are based on The Report of the Scottish Civil Courts Review, 2009 (commonly referred to as the Gill Review after the Rt Hon Lord Gill – now Lord President). These follow on from The Scottish Civil Justice Council and Criminal Legal Assistance Bill, which was the first in a series of legislative measures to be taken forward under the Scottish Government’s four-year Making Justice Work Programme. The Scottish Parliament Justice Committee meetings are available to view in their video archive. The Changing the Culture seminar was organised by The Scottish Child Law Centre in association with the FLaG Group of the Murray Stable. View the seminar programme and report. 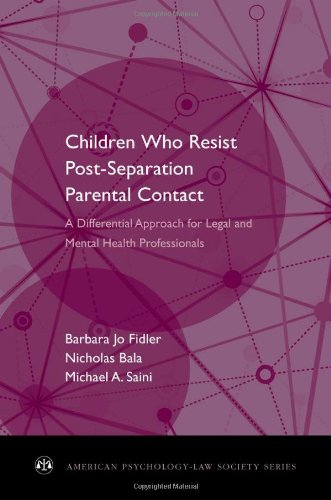 Fidler and Bala, Children Resisting Postseparation Contact With a Parent: concepts, controversies, and conundrums. Speers, R. W., and D. C. Morter (1980). 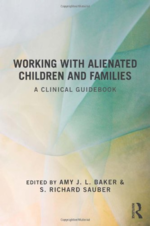 Overindividuation and underseparation in the pseudomature child.